to have a Fire Alarm Inspection Every Year. 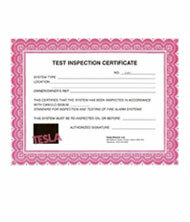 Tesla Fire Systems specializes in Fire Alarm System Installation & Certification. We have over 30 years experience installing & testing fire alarm systems. Our qualified, CFAA Certified staff can also install a system that is right for your needs. Every installation comes with a Guarantee of Quality Workmanship. Fire Alarm Inspection & Installation services. All inspections are made by qualified personnel. 2. A thorough inspection of all smoke alarms, carbon monoxide alarms and pull alarms on your premises is made. 3. Any faulty devices, including expired batteries are immediately identified to the property owner.